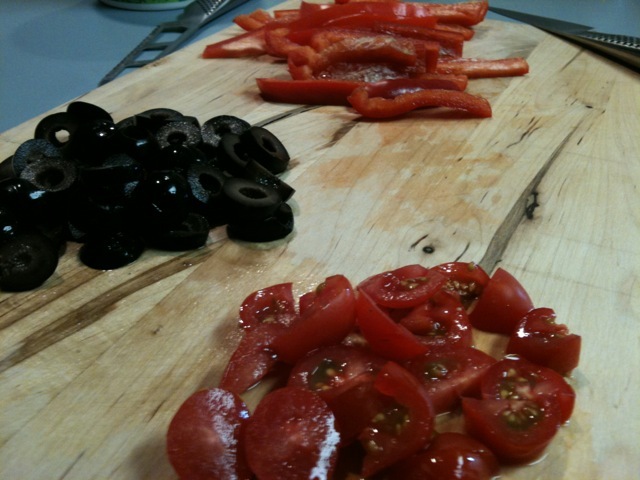 I chopped the black olives, tomato and red peppers. Michael made the guacamole. He’s pretty awesome in the kitchen and his guacamole is fantastic! Mix it all together. Depending on how spicy you like your food, vary the amount of garlic and jalapeño. I think the jalapeños and the garlic REALLY make the guacamole tasty. I think it tastes better than the restaurant guac. I cannot be trusted near “DIPPING THINGS”. That is definitely a weakness for me. Chips and salsa, guacamole, crackers and cream cheese dip, veggies and ranch dip…it doesn’t matter what it is, I will eat too much of it! 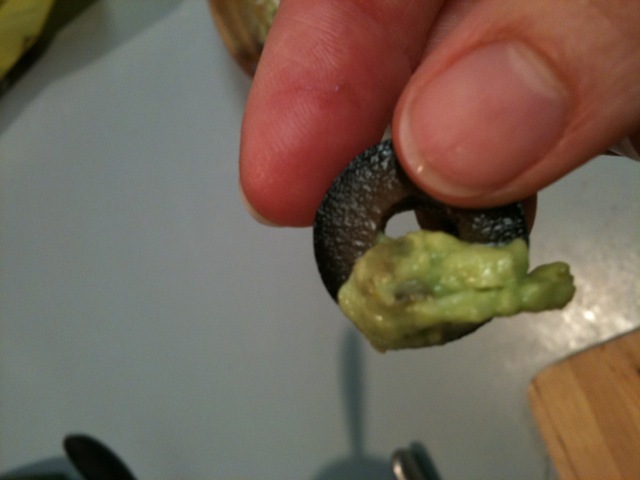 Yes–that is a picture of me dipping a black olive into the guacamole. 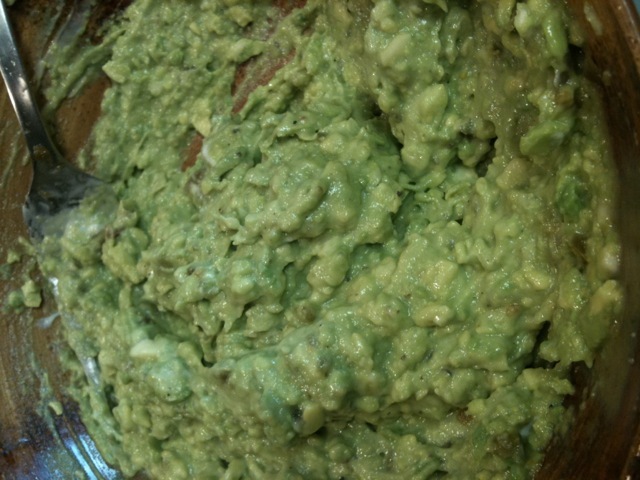 Really, the food was just a vehicle for the guacamole….love dipping! 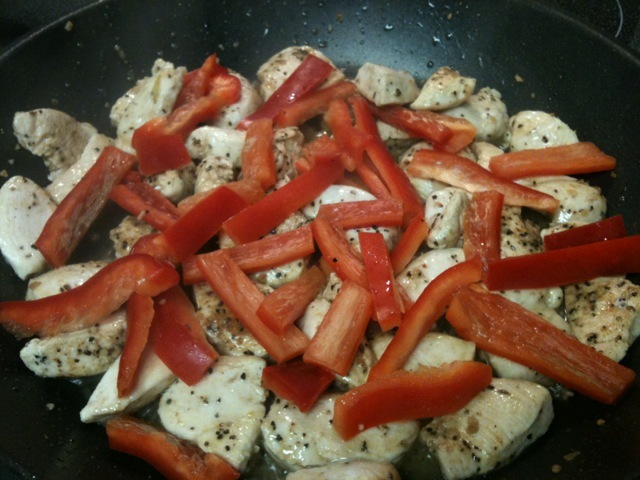 For the chicken fajitas, Michael sautéed the chopped chicken, onions and red peppers in the skillet. 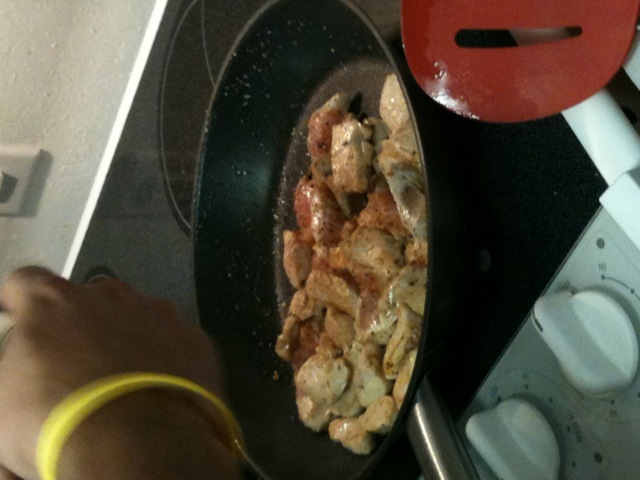 He used a lot of seasoning (like cumin and chili powder). Chicken is hard for me to cook. I never know how long to cook it for. Unlike steak that can be a little underdone–there seems to be a science to cooking chicken without drying it out. I opened a bottle of wine that we got from Hood River. It had been awhile since I’d had anything to drink. I just haven’t been feeling great and certainly didn’t need alcohol to compound that. 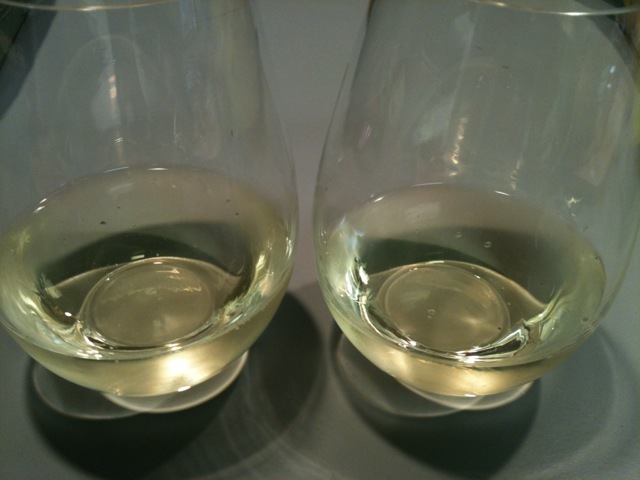 I had a glass of Pinot Grio with dinner. I only ate one fajita. 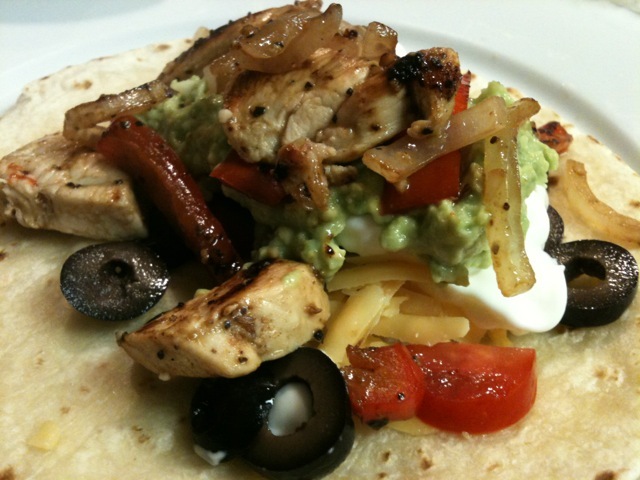 Usually I eat two but the guacamole and chips are pretty filling (and high in calories) so eating 1 fajita was the smart move. I still felt like I had overeaten a little bit. We watched an episode of Mad Men and then I did my Foam Roller and passed out. I was so tired! If you didn’t see the video in yesterday’s post, here it is again: Hood to Coast Movie. QUESTION: Do you have a good guacamole recipe you can share? What’s your secret? I loove guacamole. My favorite thing to add to it is cilantro – which I know you don’t like that much based on a recent post I read but I loooooove it. I also like to add red onions and tomatoes to bulk it up! I make a pretty good guac too, in fact I converted my boyfriend to actually like guac. Ryan swears the secret is the Cumin. Love, love, love guac. I’ve definitely been making at least once a week lately! My recipe is: avocado, lime juice, red onion, tomato, garlic, and cilantro. I agree that diced tomato makes it pretty good! Guacamole is my heart. I’d like to send that Guac to the pit of my happy stomachs. Oh I love guac, but I always let my friends be the one to make it. Yum!